TAMPA, Fla. – Aug. 19, 2016 – CONCEPT Professional Training, a global leader in online and live professional training in forensic mental health, announced today that it will be offering two 2016 Fall Training sessions focused on relevant evaluation issues. Each program consists of both guided online training plus engaging professional consultation, beginning October 9th, 2016. These two 10-week training programs are primarily intended for clinicians or mental health professionals interested or focused on expert evaluation, testimony, public defender, mental health staff, victim support staff and more. Two Fall Training sessions will be offered from October 9th to December 17th. Session 1 is called Competence to Stand Trial and Session 2 is called Mental Disability Issues in Juvenile and Family Law. Each session runs for 10 weeks and is 30 hours in length. Competence to Stand Trial is presented by Dr. Patricia Zapf. This training program is intended for psychiatrists, psychologists, social workers and other mental health professionals who conduct competency evaluations for the criminal courts or those who would like to expand their practice to offer evaluations of adjudicative competence. 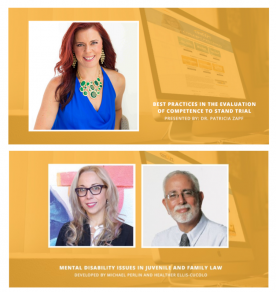 In this training program, Dr. Zapf covers the legal foundations for adjudicative competence, including new developments in the conceptualization of the Dusky standard, as well as practical and theoretical issues in competency evaluation. Competency assessment instruments are reviewed in depth as are report writing and expert testimony. Mental Disability Issues in Juvenile and Family Law is presented by Professors Michael Perlin and Heather Ellis-Cucolo. This Fall Training course will focus on topics, such as, the full range of special issues related to juvenile commitments to psychiatric institutions, issues related to the criminal trials of juveniles with mental disabilities (including, but not limited to questions of competency and waiver), correctional facilities in which juveniles are housed, the role of problem-solving courts, and the application of international human rights principles to this area of the law. As well as discussing why it is important to consider the role of sanism and pretextuality in all aspects of this system, and the application of therapeutic jurisprudence to all questions. “Our Fall Training Sessions provide you with the opportunity to discuss your current clinical cases in a small-group format with leading experts in the field,” explains Dr. Zapf. For more information on 2016 Fall Training sessions, visit the information page.